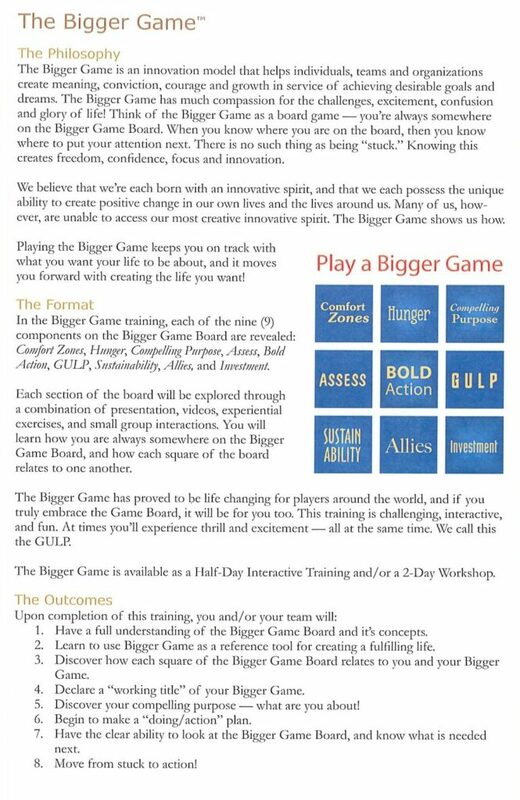 Shirley was introduced to the Bigger Game model six years ago and after the introduction and reading the book, Play Your Bigger Game, by Rick Tamlyn, she wanted to add this tool to help others learn and apply the Bigger Game concepts. Shirley was certified as a trainer November 2014. The Bigger Game was designed with the premise that life itself is one big game. If life is a game, then why not play one that excites, fulfills and challenges you. The Bigger Game was created to counteract the self-limiting, fear-based approach to life. Michelangelo said, “The great danger for most of us lies not in setting our aim too high and falling short, but in setting our aim too low and hitting the mark.” The Bigger Game is more than making a living, it’s about creating an impact. Below is the 2-day training description.